Good HCG diet information is hard to come by. Most folks who are thinking about doing the protocol worry about starving on such a very low calorie diet (500 calories per day). Yes, this would be a starvation diet without the hormone. Here is why HCG makes all the difference in keeping you from starving. The specific foods in limited amounts during this protocol are designed to support the fat burning metabolism that is directed by the HCG hormone. That is a mouthful, and if you have a fear of starving on this diet those words will not help. Here is what you must consider. Let us just say that you normally have a metabolic rate that requires 1500 to 2000 or more calories per day. It would be pretty simple math to say your metabolic rate would burn through 500 calories pretty fast. So the effective question to ask is where do the remainder of your calories come from while on the protocol. They come from your own fat. Yes, you can count on at least 2000 calories from your own fat. Specifically, this is abnormal fat. You will see the result wherever you have it … usually belly, thighs, buttocks, or upper arms. For women, this also means breasts, depending on how much abnormal fat has accumulated in them. Now, to get really visual on how this works, note how I explain this to my clients. It goes like this. Imagine that you have a magic knife that you can use to cut off a slice of your own belly fat (without pain or other trauma … remember, this is your imagination at work here). Slice off a good sized chunk, say about 2000 calories worth. Lay it out on your cutting board, sprinkle it with some salt, pepper, and garlic (okay, these are my favorite spices … use your own if you wish). Now put it on the grill, being careful not to let flames engulf it. It is fat, after all, and will burn really fast if you are not careful. Whenever you feel that your new fat steak is done to your satisfaction, sit down to a nice dinner of 2000 calories and eat it. There you have it. You have eaten your own abnormal fat. The great thing about the HCG hormone is that it directs your metabolism, through a signaling pathway in the hypothalamus of your brain, to effectively give you a fat steak from your own fat every day. So that is why the HCG diet is not a starvation diet. Is that a little clearer now? Here is a little video that I posted on YouTube. Below is my article on this topic, which has further details on what you can expect in the way of hcg side effects. Side effects of HCG may be caused by a reaction to the hormone, a reaction to the very low-calorie diet, a reaction to substances released from metabolized fat, or combinations of all of these. Determining cause and effect is not really possible. However, if the approved medical uses of HCG for treating infertility or low testosterone are any indication, certain side effects of HCG alone may be possible. Headache, irritability, restlessness, depression, fatigue, edema, precocious puberty, gynecomastia (i.e., breast enlargement in males). These are due to the high doses that are used in medical treatment. The question is whether they are also associated with the low doses of HCG that are used for the HCG diet. The following observations are derived from reports by clients who have gone through the HCG protocol and from my own experience. FATIGUE: The most common one is fatigue. This occurs almost 100% of the time. It is independent of starting weight or health status. People who work out regularly are less able to keep up their workout intensity. Those who are out of shape and inactive in the first place slow down even further. IRRITABILITY: The ‘significant others’ of HCG dieters notice this first. It is very common. In my own experience, I even felt more irritable. By the end of the protocol, the quick recovery back to normal, after being more irritable for a month or more, was like going from night to day. HEADACHE: At least 10 percent of the HCG dieters report headaches for the first few days of the protocol. Headaches stop after the body’s initial water loss during this period, when sufficient water intake begins to rehydrate the body. Water intake is the key to reversing this brief period of accelerated dehydration. REDUCED NEED FOR SLEEP: Many dieters report that they sleep less during the protocol. This is a well-recognized side effect of the HCG diet. People do not feel as though they are sleep deprived. They just seem to need less sleep. CONSTIPATION: Dieters who are prone to constipation notice that it is more pronounced on the protocol. It is crucial to treat this symptom immediately so that passage of waste, as well as daily weight loss, proceeds normally every day. Constipation will otherwise slow down or stop weight loss completely. MINOR OCCURRENCES: Dozens of side effects that have been reported to be associated with the HCG diet are much more difficult to validate. Most seem to be associated with bad health. Blogs and forums are rife with reports of these kinds of symptoms. However, the only other side effects that are common enough to be expected are the beneficial ones, as mentioned below. Dr. A.T.W. Simeons already reported these observations in 1954. The main ones of greatest impact to modern users of the protocol are: 1) normalizing blood sugar metabolism; 2) lowering cholesterol; and, 3) lowering blood pressure. Dr. Simeons’ explanations of these side effects are detailed in his book, Pounds and Inches. They are to be expected for everyone who undertakes the protocol. Besides fat loss, these are most crucial results from the protocol. They help slow down and even reverse hypoglycemia, diabetes, and heart disease. The HCG Diet is really much simpler than people make it out to be. The science has been known for more than 50 years. Here are the key points that explain this weight loss protocol in a nutshell. Way too many people make the HCG Weight Loss protocol much more complicated than it really is. It is simply a hormone-directed, very low-calorie diet that is ultra-low in fat and carbohydrate. The recent growth in popularity of this protocol, however, has attracted so much nonsense that it is difficult to know what is right and what is wrong. Way too many people make the HCG Weight Loss protocol much more complicated than it really is. It is simply a hormone-directed, very low-calorie diet that is ultra-low in fat and carbohydrate. The recent growth in popularity of this protocol, however, has attracted so much nonsense that it is difficult to know what is right and wrong. HCG (Human Chorionic Gonadotropin) is a complex protein hormone that is produced by pregnant women. Its normal function is to direct the mother to use her own stored fat to nourish a developing fetus. Different forms of HCG include injectable, oral (sublingual), transdermal (cream), and homeopathic drops. I have no scientific basis for evaluating homeopathic HCG, since it contains no actual HCG. All other forms contain measurable dosages of the hormone. Native HCG that is isolated from the urine of pregnant women is available under several brand names, including Pregnyl, Follutein, Profasi, and Novarel. A genetically engineered form of HCG, called Ovidrel, is produced by Chinese Hamster Ovary (CHO) cells. It is not identical to the complete native hormone. Nevertheless, it works just as well as the native hormone. The diet consists of four components in each of two daily meals: 1) a nonfat protein; 2) a vegetable; 3) a fruit; and, 4) a serving of Melba toast. The program also encourages the intake of plenty of water and allows unlimited amounts of black coffee and tea. Stevia is the only approved sweetener. Because HCG is a hormone that “trains” specific brain receptors, it advisable to use the hormone for a minimum of 27 days (the 30-day program) or a maximum of 40 days (the 43-day program). Maximum weight loss during the 30-day program is typically 25 lbs. For the 43-day program it is typically 35 lbs. Further reduction beyond 35 lbs. requires an additional HCG series after a layoff period. Fat reduction via HCG shapes your body by burning abnormal fat. You will not go below a healthy weight level or become too “skinny” – you will simply look the way you are supposed to look when you are not carrying excess abnormal fat. According to Dr. A.T.W. Simeons, the discoverer of this program in the 1950s, the bonus benefits of the HCG Weight Loss Diet include restoring steroid hormone balance, slowing or reversing the downhill slide of hypoglycemia and diabetes, re-energizing thyroid and adrenal glands, breaking up arterial plaque, reducing rheumatic pain, and lowering blood pressure. Lifetime Aftercare: HCG-based weight reduction is only the first phase. You must also follow certain dietary guidelines (i.e., no sugar, low starch) for a 3-week second phase. You must also adopt a sensible diet and lifestyle for the rest of your life. This is when right diet, exercise, supplements, and lifestyle are most important for your long-term weight management and total health. Lifetime Supplements: This is another topic that has attracted a lot of craziness. Keep it simple! There is nothing simpler or better than what I have already assembled at Doctors Nutrition Center for the HCG Diet Aftercare Supplements. How Effective is the HCG Protocol? Dr. Simeons estimated the effectiveness, or success rate, at better than 90%. In my experience, this depends on compliance. If you do not follow the protocol, you will fail. Furthermore, if you do not live sensibly after you reach your target weight, you will gain rebound fat. There are no silver bullets, magical drugs, or miracle surgical procedures that can help you if you do not do the right thing. I hope that helps your thinking a little bit! The HCG diet has been around for awhile, but lately is has been garnering more attention as more people come forward with their weight loss success stories. The HCG diet was researched and developed by Dr. Simeons as a cure to fight the obesity epidemic that we have in our world today. Dr. Simeons wrote a HCG diet protocol in his manuscript called Pounds and Inches, but for many people, this manuscript is not the easiest to understand. 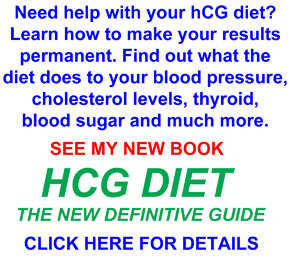 If you are interested in the HCG diet and losing weight, here is what you should know about the diet. HCG, which stands for Human Chorio Gonadotropin, is a natural hormone that is found in both men and women. When you are born, you are born with a certain amount of HCG and the only time that more is made is when a woman becomes pregnant. This hormone works in conjunction with the hypothalamus gland to help regulate body fat, control emotions, and help to develop reproductive organs. The main reason why people need to supplement their body with more of this hormone is because so many of our foods and things in our environment contain toxins that will actually strip the HCG from your body. Such things like antibiotics will remove some of the HCG from your body. Dr. Simeons founded the HCG diet on the foundation that taking extra amounts of the hormone will help you to regain balance with your body and lose the extra weight you may be carrying. He paired the HCG doses with a specific low calorie diet to come up with a way that a person can easily lose one pound a day while on the HCG diet. The HCG works with the body to burn the stored fat that you have accumulated while maintaining the muscle in your body. The diet is all natural. As mentioned before, the hormone is already produced by your body, but it may be lacking and needs to be replenished. Unlike other fad diets that claim to help you lose weight quickly, the HCG diet is all natural and does not contain any harmful chemicals. The dose of the hormone can be taken orally with a dropper or they can be injected with a syringe. The HCG diet is not a fly-by program. It does take real dedication to stick to the proper eating and the daily dose of HCG. Fortunately, most people who have started the program easily saw huge results within the first week, which is great motivation to stick to the plan.